Orly Zilbershatz-Banai stars as Dafna, a mother struggling to keep her family afloat after the sudden death of their beloved father. Forced into a role of surrogate mother to her two youngest siblings, Ido and Bahr, budding songwriter Maya grudgingly tackles domestic chores and struggles to finish her education. Her more philosophical brother, Yair, declares that life is meaningless. To prove his point, he quits high school and takes a job distributing pamphets on the metro dressed as a giant mouse. Could life become more absurd? When a terrible event strikes once again, only a miracle can save them - a miracle born of love. Foreign movies are a mixed bag, especially foreign drama movies which are either great or mediocre and unfortunately Broken Wings falls into this category. 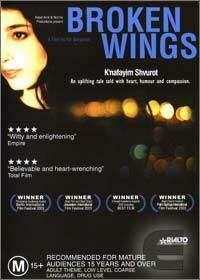 This rather droll tale centres around Dafna, a mother who has had the love of her life taken away from her. Depressed, Dafna believes that life is meaningless and embarks of a tale of nothingness until a clichéd miracle saves the story. Video and Audio quality are average with no extras whatsoever, only a tale for those feeling some melancholy.